Beyond Pantries: This Food Bank Invests In The Local Community : The Salt Normally, food banks distribute donated food to the hungry. But Rochester, NY, food bank Foodlink, is going beyond that to provide fresh foods to poor communities and jobs to boost the local economy. Customers check out the produce at a Curbside Market truck parked at Andrews Terrace, a large apartment complex in downtown Rochester. 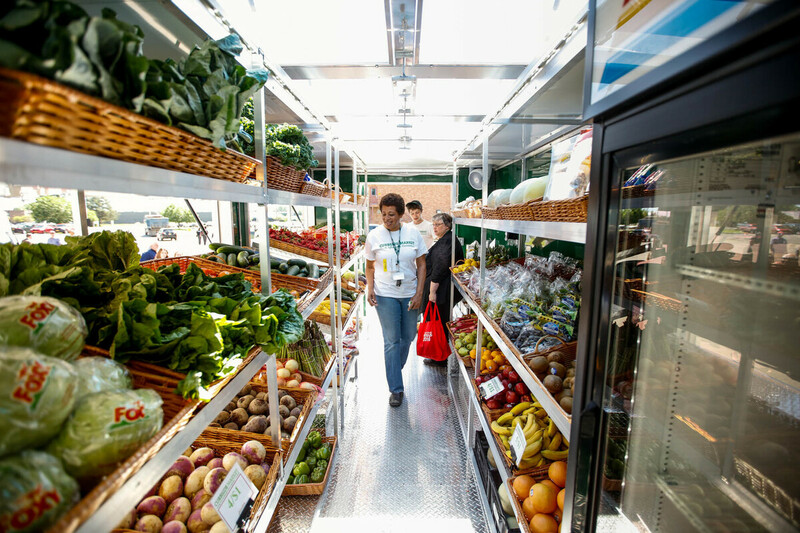 The program is part of Foodlink's efforts to help poor communities have access to fresh and healthy foods. Wayne County, New York, is the biggest producer of apples in the Empire State. Yet, in 2013 public school children in the county were being served apples from Washington on their lunch trays. At the end of the lunch period, the lovely, whole Washington apples ended up mostly uneaten in the garbage. Tom Ferraro, founder of the Rochester, NY, food bank Foodlink, set about solving the problem. Ferraro was familiar with a recent study showing that children were more likely to eat sliced fruit than whole. 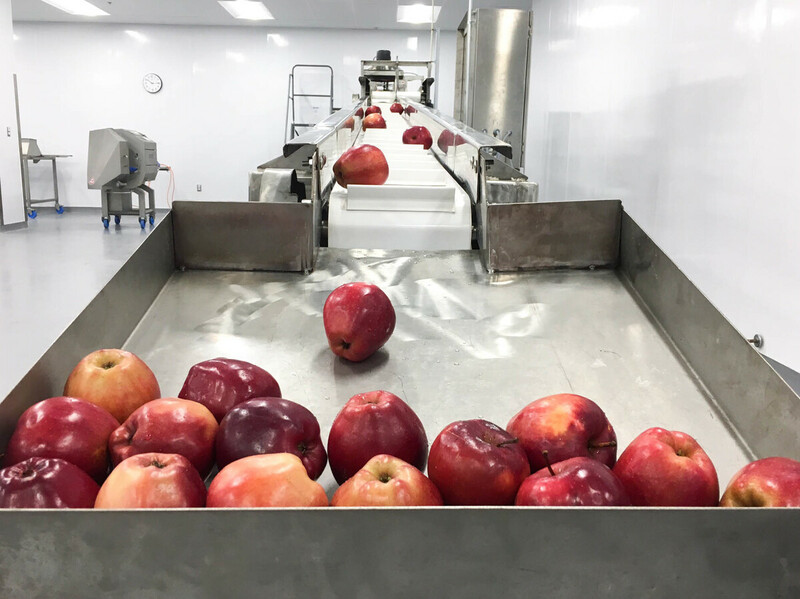 Since Foodlink had the facilities to wash, slice and package apples into portions, Ferraro decided to purchase apples from local farmers, process them, and sell them back to local schools. The program has been a success. Since July 2014, Foodlink has purchased 3.8 million pounds of local apples, investing $600,000 into the local agricultural economy. Children are eating the apple slices. And Foodlink uses revenue from apple sales in its own kitchen to prepare scratch-cooked meals for local school lunches, after-school and summer programs. Washed apples collect in a bin, ready to be sliced in Foodlink's processing center. The sliced apples are sold to local public schools to be served to their students for lunch. The program supports local apple farmers and provides fresh fruit to children. "It's outside the realm of what most people think of when they think of a food bank," says Julia Tedesco, the executive director of Foodlink. But this aligns with the organization's mission, she adds. By investing in the local economy, the organization has been able to tackle the root cause of hunger – poverty. Foodlink has nearly doubled its staff since it started investing in local produce, therefore creating new jobs for the community. At the same time school children are eating more nutritious scratch-cooked foods. It's a way for Foodlink to "nourish this community by nourishing the economy and the individuals in it," says Tedesco. Foodlink's ongoing work represents a new direction in food banking — a shift from simply storing and distributing food to addressing America's hunger crisis by focusing on ways to alleviate poverty as well as providing healthier foods. According to the most recent report by the U.S. Department of Agriculture, 42.2 million Americans live in food-insecure homes — double the number on food stamps in 1980. Food banks have increased in number from 200 regional food banks in 1980 to more than 60,000 food banks, food pantries, and soup kitchens today, according to the grassroots support organization WhyHunger. Despite this increase, there's an ever-growing recognition among food-security experts and food-bank leaders that food banking is not a long-term solution to hunger. First founded in the late 1960s, food banks multiplied during the 1980s recession, buoyed by cuts to federal programs including Medicaid and food stamps. "Prior to 1980 the existing food pantries were typically a shelf in a closet of the pastor's study," says Janet Poppendieck, senior fellow at the CUNY Urban Food Policy Institute. "Once or twice a month a family would be referred for food help." In the nineties food banking became more entrenched to address the growing need. Organizations invested in warehouses, loading docks, and truck fleets, what Poppendieck calls the "institutionalization" of food banking. However, this didn't abolish the hunger crisis. In the past 20 years, the rate of food insecurity among U.S. households has barely shifted from 12 percent in 1995 to 12.7 percent in 2015, according to the USDA. "You can never meet the demand," says Andrew Fisher, cofounder of the non-profit Community Food Security Coalition and author of Big Hunger: the Unholy Alliance Between Corporate America and Anti-Hunger Groups. "When the economy goes south, people see recession, the unemployment rate, human suffering, and they donate more money to food banks." However, Fisher adds, the more charitable food that is distributed, the more people will take it. "The need is insatiable." What's more, the rising number of people with obesity and diabetes in recent decades has complicated matters for food banks. Historically, much of the food donated to food banks has been canned or processed foods often high in salt, fat, and sugar. Increasingly, food-bank leaders see the need to source more fresh fruit, vegetables, meat and dairy. To address these issues, there's a two-fold change in food banking. First, there's an ideological shift away from the goal of quantity of food distributed to a preventative goal to keep people from entering the emergency food system in the first place. Prep cook Josh Orsini prepares food in Foodlink's kitchen. Meals prepared here are distributed for after-school programs and summer meals programs. They mostly serve children in need of free, healthy meals. "In the last 15 years we've looked beyond emergency food distribution and done more programs focused on the root causes," says Foodlink's Tedesco. "Hunger is a symptom of poverty, not the cause of the problem. No one woke up hungry on any given day without something else having gone wrong first." In early 2018 Foodlink is launching a job training program called the Community Kitchen Institute. 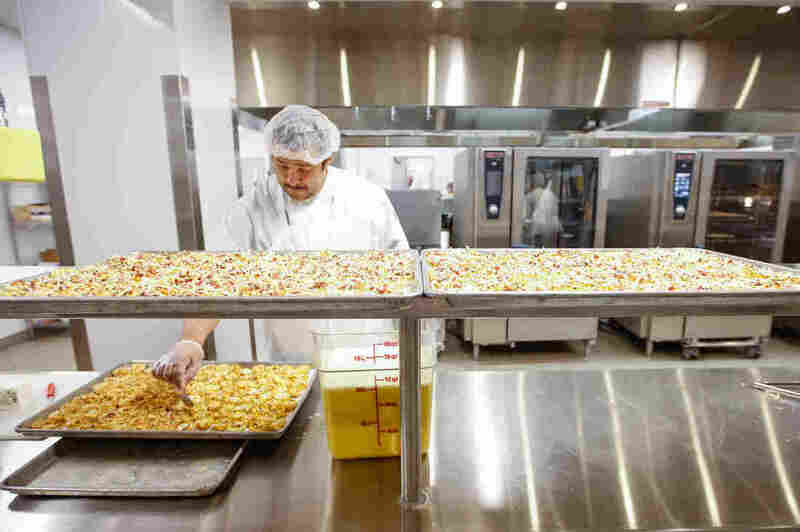 Targeted towards individuals with barriers to well-paid jobs — refugees, former inmates, or those without a high school degree — the program will prepare potential employees for better paying jobs in the food industry. Training includes everything from literacy to communication skills and how to manage work-life stress. There's also a stipend to cover childcare and transportation costs. The second major shift in food banking addresses the health crises of obesity and diabetes. It's a tactical shift partly triggered by changes in the food industry. At the outset, food banking was based on surplus goods, the excess and seconds from manufacturers and retail stores. However, as more consumers buy food online, there's less volume flowing through supermarkets. So the supply of excess food has decreased. Also, with greater attention to distributing nutritious food, food banks are handling more fresh produce — not just shelf-stable processed foods. 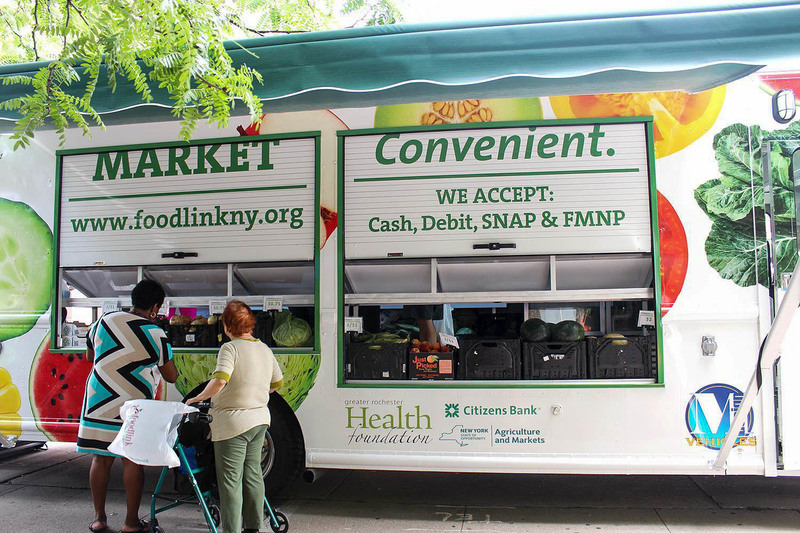 For its program Curbside Market, three Foodlink trucks travel throughout the Rochester area to sell fresh fruits and vegetables at affordable prices to some 30,000 customers in communities underserved by grocery stores. The food bank also provides 1.3 acres in northwest Rochester where refugees from Nepal, Bhutan, and Somalia now grow about 5,000 pounds of food annually, feeding 60 families and providing food for other Foodlink programs. Fresh fruits and vegetables stocked inside one of the trucks used in Foodlink's Curbside Market program, which sells fresh foods at affordable prices to poor communities. Handling perishable food, however, requires new infrastructure — refrigerated warehouse storage and climate-controlled trucks. Last year Feeding America, the nation's largest food-banking organization, convened a group of food banks to address this challenge. CEO Diana Aviv described the problem of receiving an excess of one particular product, say, three semi-trucks of bananas, which is more than any one food bank needs. Aviv spoke about creating regional mixing centers so food banks could access a greater variety of fresh foods. Still, critics of the charitable-food-distribution model say it's not enough. According to Bread for the World, a Christian anti-hunger advocacy group, one of every twenty bags of groceries for food-insecure people comes from food banks and private charities. The remaining 19 bags come from federal government programs. "That model of trying to food bank your way out of hunger isn't possible," Fisher says. "The scale of it compared to the SNAP program (Supplemental Nutrition Assistance Program or food stamps) is miniscule. Compare $5 billion worth of food being distributed, which is enormous, to SNAP, which is $70 billion. There's no way you could build an infrastructure that big, even if we thought that was a desirable outcome." Still, Fisher explains, food charity fills the gap when SNAP benefits run short. Typically federal benefits last only three weeks out of the month. And Fisher is optimistic about innovative food banks like Foodlink that promote health in their communities, offer job training, grow local food businesses, and advocate for an increase in the minimum wage. At a 2015 industry conference called Closing the Hunger Gap, food bankers estimated that about two thirds of all food banks are either working on progressive models for ending hunger or moving in that direction by rethinking their mission. "The old model of food banking is going to change," says Tedesco. "That's what has catapulted people into thinking more about the long-range goals here. It's not just the redistribution of food." Anya Sacharow is a food and lifestyle writer. She is the author of Brooklyn Street Style: The No-Rules Guide to Fashion.